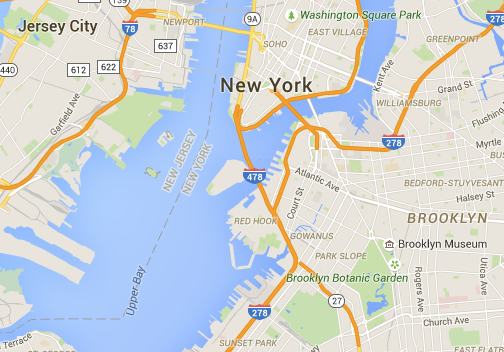 Hello, and welcome to Red Hook, Brooklyn! It’s the coolest waterfront community in all of Kings County, and the neighborhood with the clearest views of Lady Liberty’s front side. See here, the landmark at my 5 o’clock: I assure you the historic 305-foot woman is closer than it appears in this photo. Red Hook juts out into the New York Harbor where it faces Staten Island, Manhattan, and New Jersey and where NY Water Taxis, barges, and cruise ships all hang out. What was once the busiest freight port in the world is now a unique community of artists, developers, old-timers, and families; to this point, Red Hook, within the last 10 years, has gained appeal from Manhattanites and Brooklyners alike, seeing it as an off-the-beaten path option for NYC dwelling. Akin to the Brooklyn you visited or saw in some (relatively recent) film, there are wine stores, bike shops, bakeries and galleries around most corners. It’s walkable and people dress really, really well – even when they’re walking the dog! 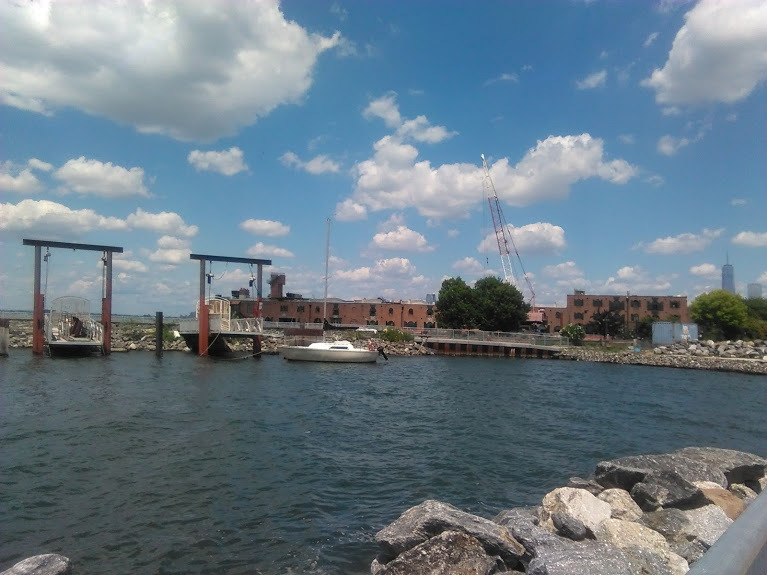 After almost one week in Red Hook, I can begin to identify obvious geographic, economic, and social characteristics that define the neighborhood beyond its status as a waterfront getaway. For example, most people mention the 1930s construction of the six-lane Brooklyn-Queens Expressway as a historic moment that cut off Red Hook from the rest of Brooklyn; today the BQE poses challenges for all residents working and going to school outside of Red Hook. 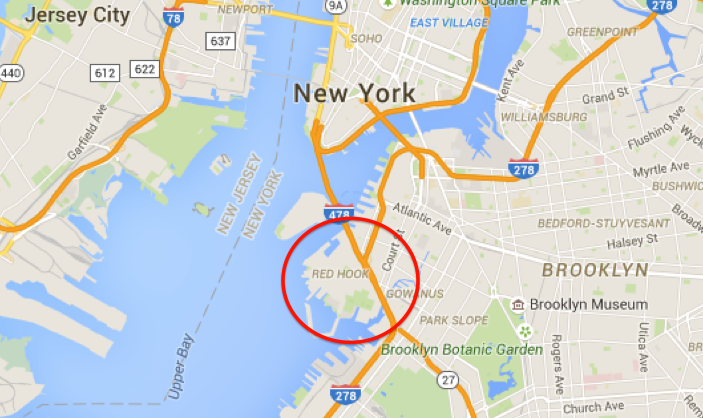 The closest subway stop – a necessary vehicle for travel throughout NYC – is between 3/4-1 mile from Red Hook. While the BQE went up, construction began on the Red Hook Houses right next door to accommodate the growing number of dockworkers in Red Hook. 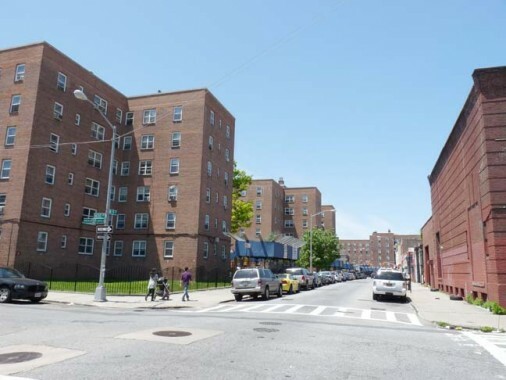 Today, the sprawling neighborhood of mid to high-rise red-brick buildings is the second-largest New York City Housing Authority site, and the biggest in Brooklyn: Almost 8,000 people are reported to live in the Red Hook Houses – that’s almost 75 percent of the Red Hook population. Some say that one street is the evident marker of the physical, visible divide between the Red Hook Houses and the waterfront community. Others tell me that the divide was brought to light during the public debates over welcoming IKEA and Fairway grocery store into the neighborhood. Either way, Red Hook takes on a different meaning that form-fits based on the individual experience. Of course, contextualizing place isn’t a breakthrough approach: Don’t students, faculty, and residents each have a different opinion of “community” in the Village of Geneseo?